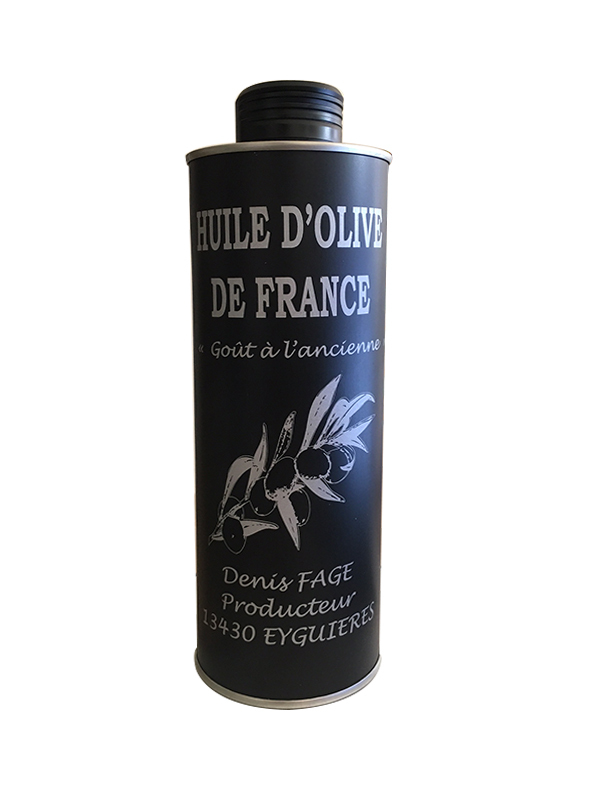 Denis Fage produces an extra virgin olive oil of high quality, cold extracted, obtained directly from olives and only by mechanical process to get a pure fruit juice, without any chemical method and refining. After washing the olives, Denis process to the grinding. The cold extraction is done by the centrifugation system which allows the separation of oil, water and pomace. 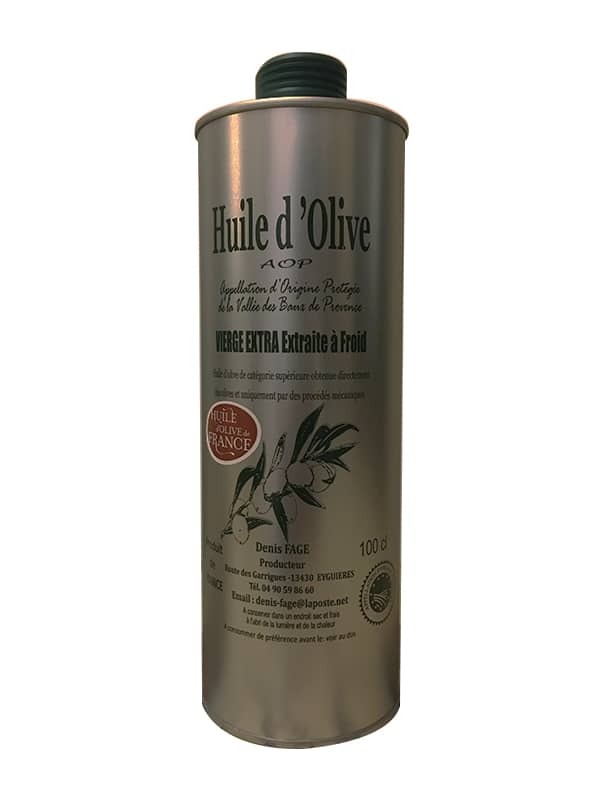 The PDO Green fruitiness, PDO Olive oil from Vallée des Baux de Provence : An intense and fruity taste characterized by its sweetness, its velvety and its beautiful golden green color. 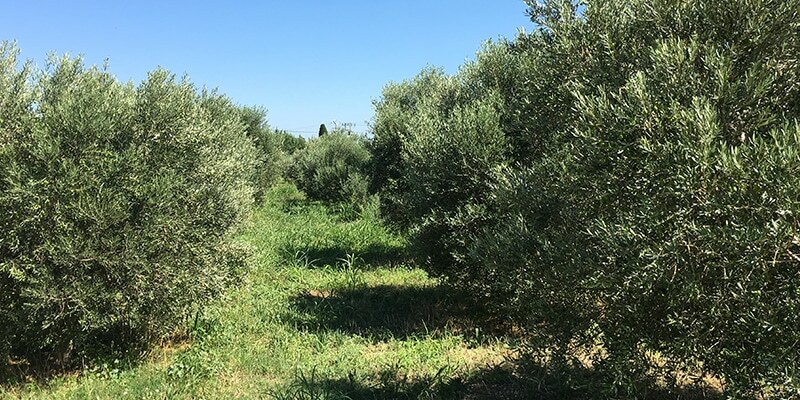 The olives are harvested in the middle of maturity to obtain a nuanced olive oil, aromas of fresh hay, cut grass with a light uncooked artichoke perfume and a subtle taste of dry fruits and almonds. Classic and wise, delicate and harmonious, this extra virgin oil will delight the amateurs. 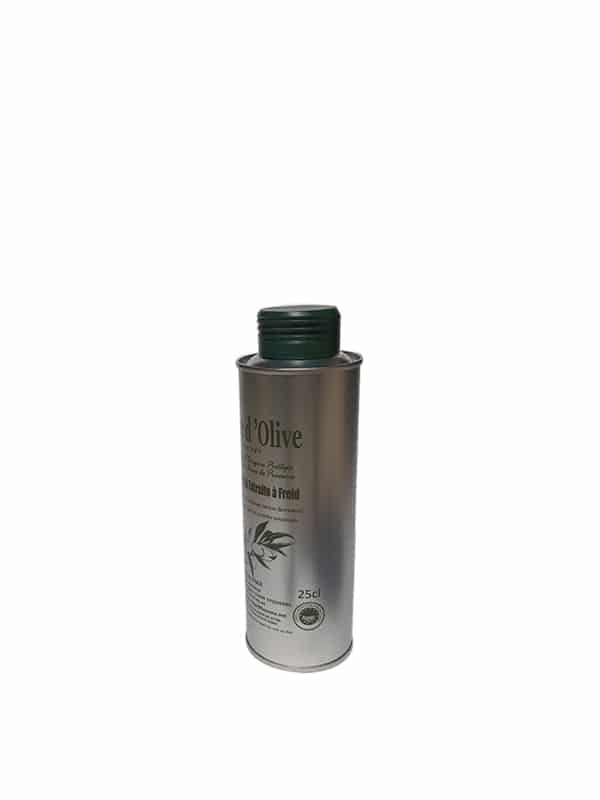 An olive oil which has the power to reveal the most finest dishes. 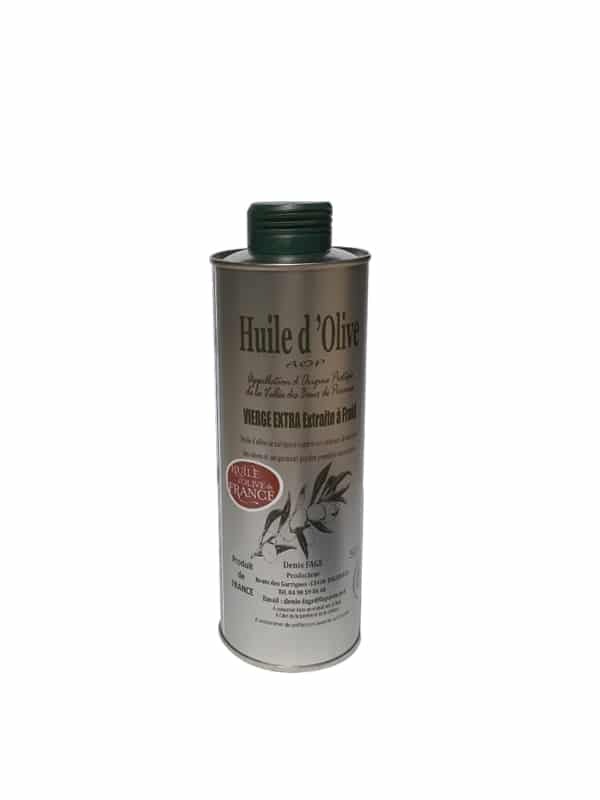 The black fruitiness PDO Olive oil from Vallée des Baux de provence : An old-fashioned taste is remarkable for its sweetness and its authenticity. Free from bitterness, its presents also a bit of fiery. 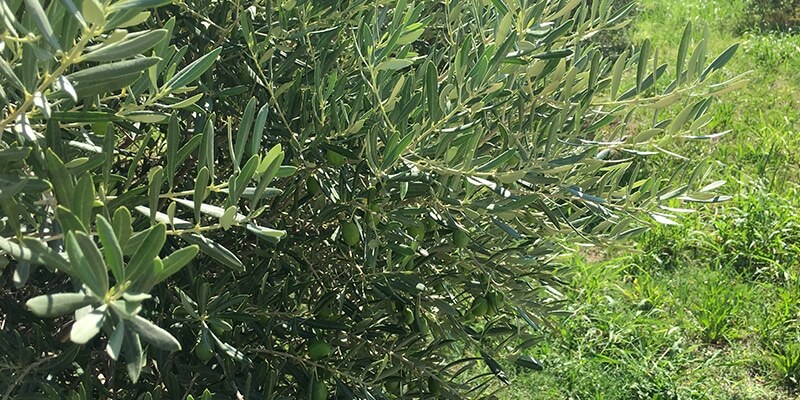 After the harvest olives are stocked and matured in mastered conditions while 4 or 8 days before the extraction of oil. The aromas of candied olives and black olives, truffles of this olive oil will seduce the amateurs of this provençal tradition. Extra virgin AOP olive oil from the Vallée des Baux de Provence – Green fruty, intense taste and fruty. Extra virgin aloive oil AOP from la Vallée des baux de Provence – black fruty with old taste. 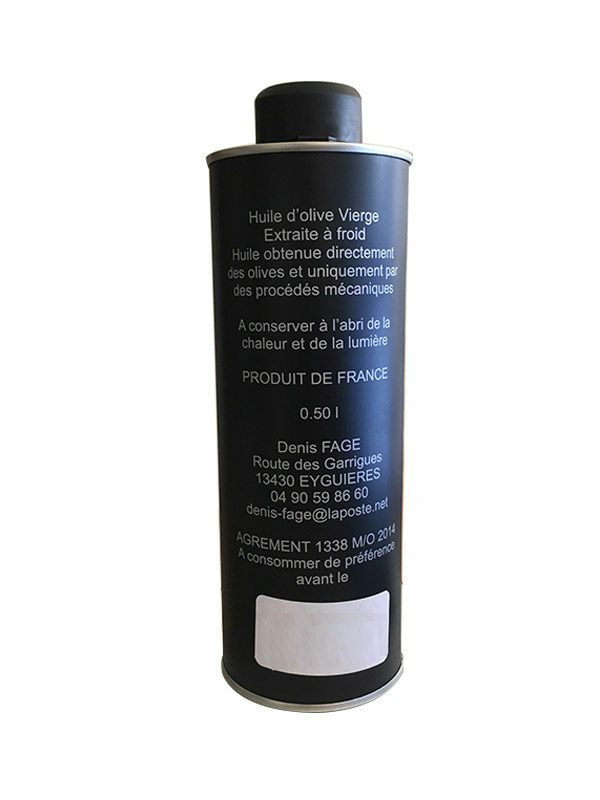 Denis Fage’s production of extra virgin PDO olive oil from la Vallée des Baux de Provence represents approximately 2000 L per year. 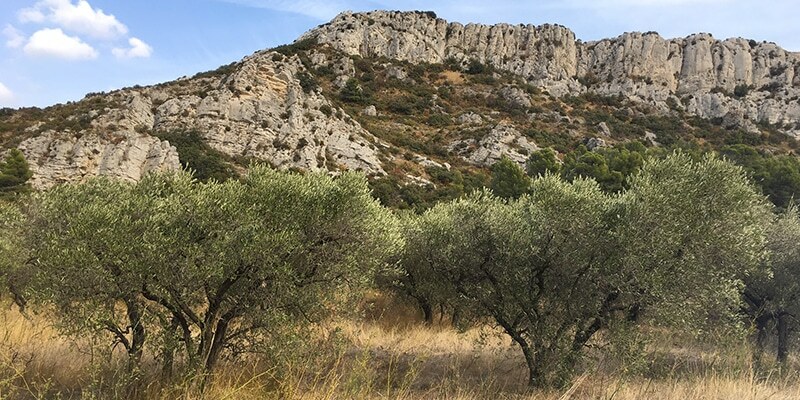 Olives came from la Vallée des Baux de Provence, olive oil extraction and packaging are done at the oil mill in Eyguières, France. At the gates of the Alpilles in La Vallée des Baux de Provence nestles the plots of the olive grove in Denis Fage’s mill. He’s a real joyful provencal man who like his terroir and his mill. 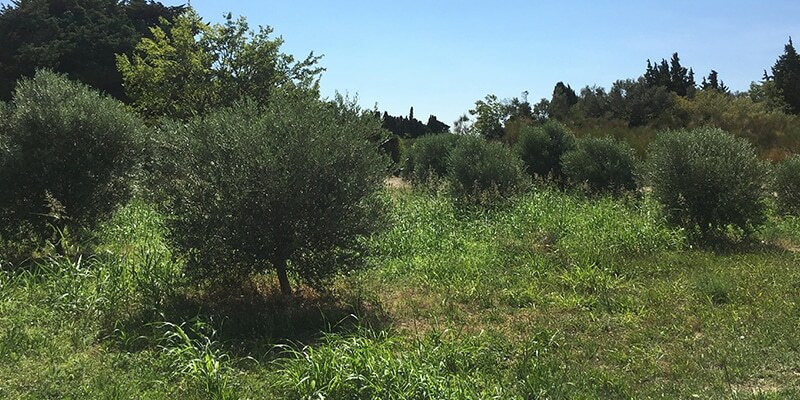 From 3 generations, the Fage family cultivates olive trees and Denis childhood memories are relied to the perfume and savors of the olive oil. Through the years, he knows how to gave birth to some extra virgin oils with character, PDO of La Vallée des Baux de Provence. 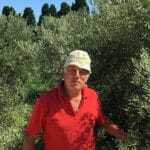 Always with passion and in the provençal tradition, he cultivates olive trees and harvests them always at the right moment. With rigor and technicality, Denis proceeds to the extraction of the olive oil and to the assembly of the different varieties formed by the PDO of La Vallée des Baux de Provence. 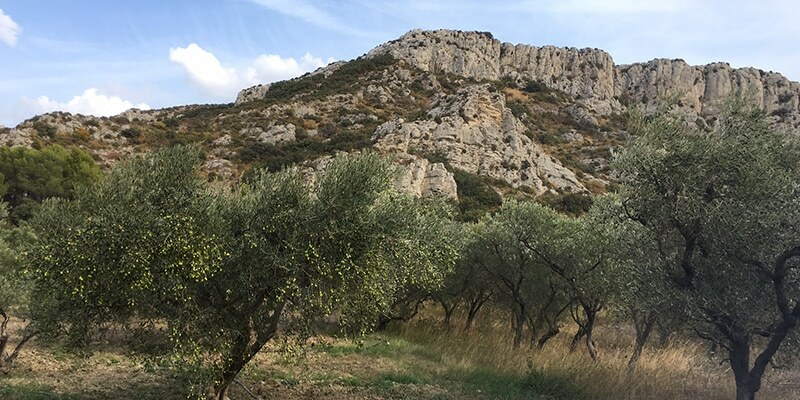 Close to Eyguières, an authentic village in the Alpilles, olive tree plantations of Denis Fage are rocked by the cicadas song. 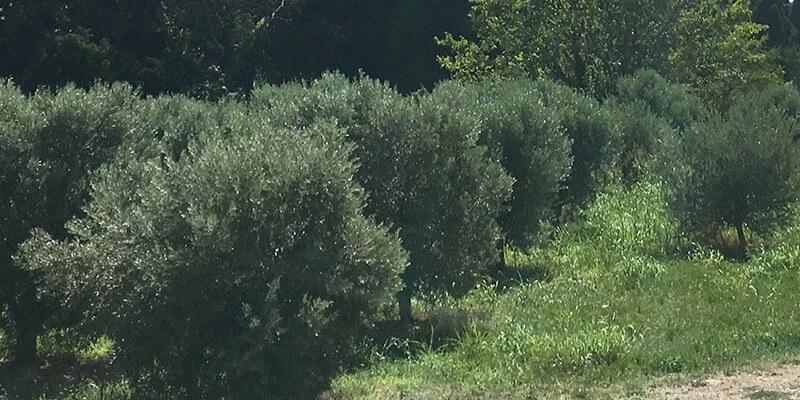 In the autumn, olives are harvested at maturity, the dominant varieties are the Salonenque one’s, the Verdale of Bouche du Rhône, the Grossane and the Aglandau (or Béruguette). The assembly of those 4 varieties allows to have an PCO from the Vallée des Baux de Provence extra virgin of superior quality. Salonenque : A delicate and creamy olive oil with aromas of apple, uncooked artichoke and cut herbs. Verdale : Olive oil is particularly sweet without fiery and bitterness. The aromas released by this oil are fresh butter, nut and tomato. 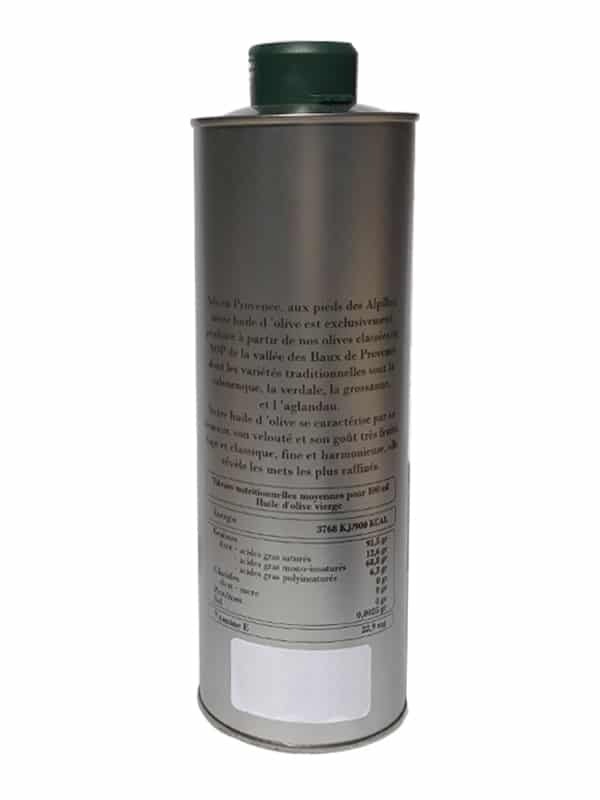 Grossane : This sweet olive oil with grapefruit aromas are lightly fiery in the throat. 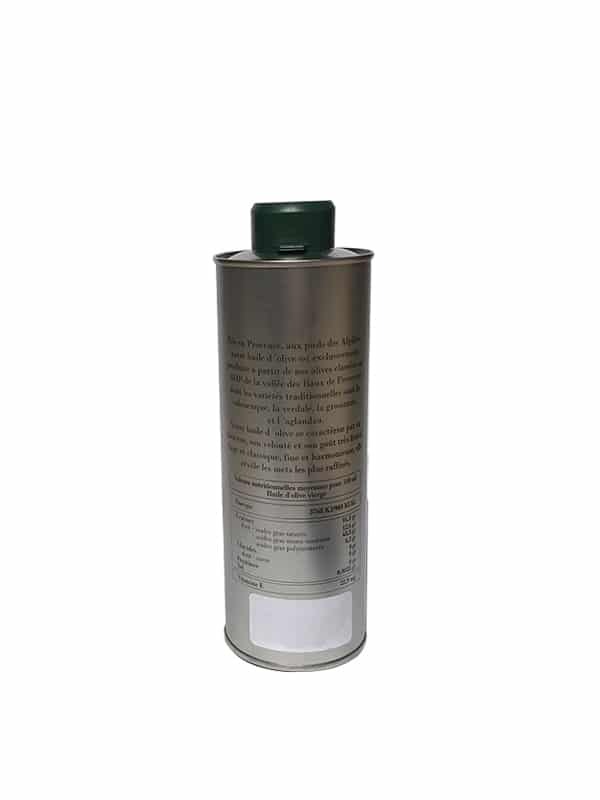 Aglandau : This olive oil is charactered by its vegetal fruity. It’s fiery with a light peppery bitterness. The extra virgin AOP olive oil from the Vallée des Baux de Provence with a green fruity and an intense taste : a sweet and velvety oil, delicate and harmonious, wise and classic with aromas of fresh hay, cut herbs and a small perfume of uncooked artichoke and a subtle taste of dry fruits and almonds. 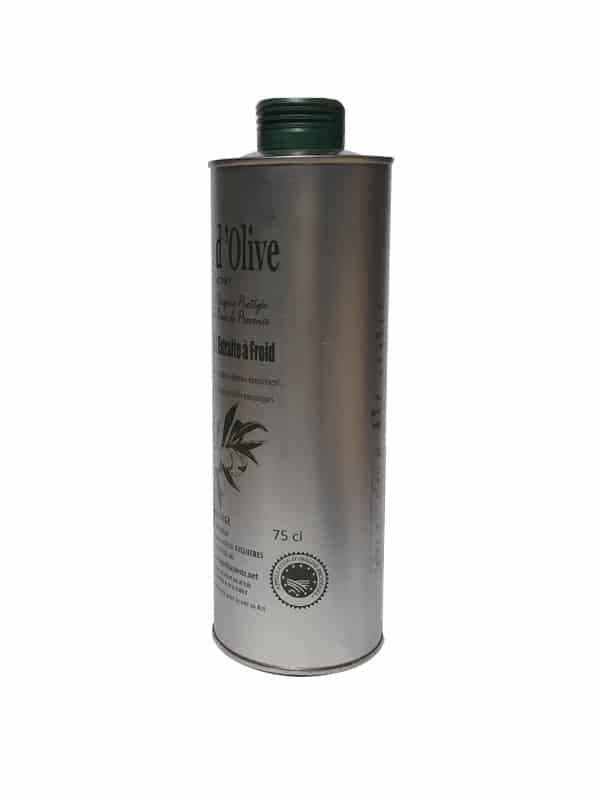 A olive oil to discover on green salads, tomatoes and eggplant, fish, meats. For an original note, you can add some drops of this olive oil on your strawberry or raspberries desserts. 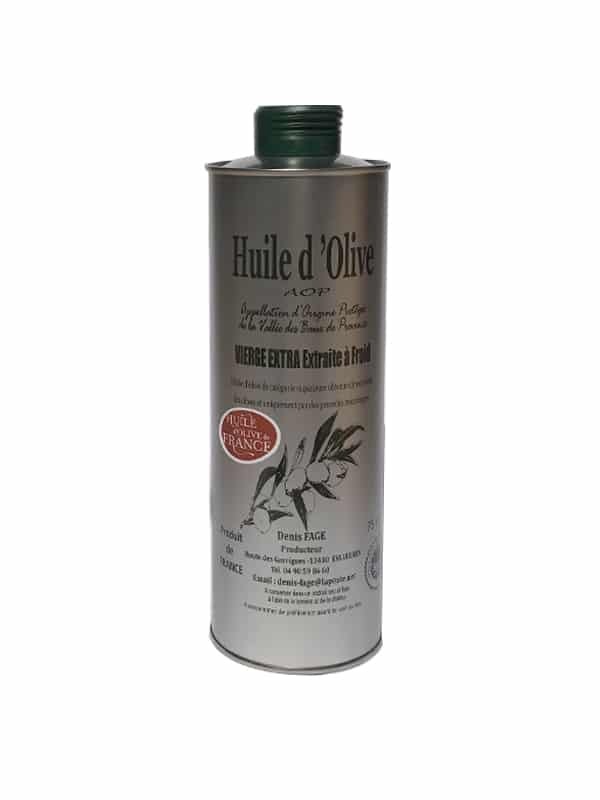 Extra virgin olive oil AOP from the Vallée des Baux de Provence with a black fruty, and old taste : sweetness and authenticity of candied olives, black olives, truffles. Without bitterness and a little bit of fiery. An olive oil to favour with lamb and bull. But also, shellfish, oysters and molds. Excellent for the confection of chocolate desserts.